(Richard Carlile.) 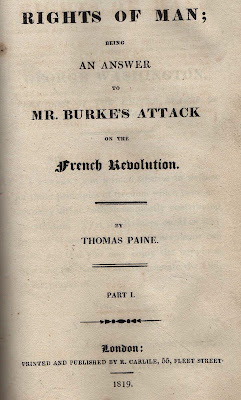 THE POLITICAL AND MISCELLANEOUS WORKS OF THOMAS PAINE. Carlile, London 1819. The rather muted publicity given to the bicentenary of Thomas Paine’s death this year reminds me of the interview I had with the late lamented maverick actor and film-maker Kenneth Griffith a few years ago. Lured to his large Victorian house in Barnsbury ostensibly by the promise of an introduction to his uniquely vast library of books and memorabilia on the Boer War, for much of the time I found myself being regaled with off the record tales, including a recollection of the time when leaders of the IRA were invited to tea and how Griffith’s film on Thomas Paine was deemed too radical to be broadcast. The seriously inflammatory writings of the famous atheist and republican, born in Thetford in 1737, were banned by the British authorities from the start, but suppression was particularly draconian in the period of political unrest following Waterloo, when any publisher or bookseller who dealt in Paine’s writings, faced jail and bankruptcy. The publisher who stood out as Paine’s greatest champion in this era was Richard Carlile, a Devonian tinsmith who had turned to radical publishing in his mid twenties and from whose premises at 55, Fleet Street (‘The Temple of Reason’), a steady stream of seditious literature emerged for six or more years. Carlile, incidentally was the bookseller who somehow managed to obtain 180 copies of the first edition of Shelley’s audacious, privately printed , Queen Mab (1813)— a copy of which Rota wants £23,000 for. 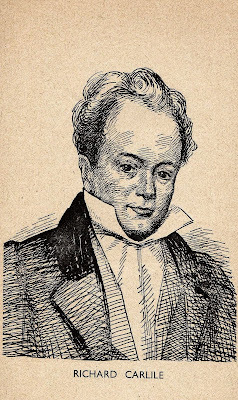 Carlile ( 1790 – 1843 ) quite simply refused to be silenced and when he was carted off to Dorchester jail in 1819 he brazenly spent the next five years conducting his business from behind bars. As a political prisoner, rather than a common felon, he enjoyed, like Leigh Hunt before him, a measure of freedom and comfort. Although he had little time for flowery wallpaper and an ottoman, his ‘ Repository of Reason ‘ was comfily appointed with sink, bed, desk, odd bits of furniture, and the use of two servants to cook & clean. Carlile also took up vegetarianism while in jail and worked out with weights to keep himself fit. Naturally, he was left with plenty of time to edit his radical magazine, The Republican, which the jailers didn’t seemed to mind him doing, though apparently when he once misbehaved his frying pans were confiscated. I’d been looking for something by Carlile when quite by chance I found it on the shelves of that funny little bookshop in Harmood St, Camden Town. This was volume one of Paine’s Political and Miscellaneous Works dated 1819, which was bound in a sort of suede decorated with an abstract pattern in pyrography which I like to think was done by a fellow political prisoner to pass away the hours. This was the book, an earlier edition of which, turned one of the Cato Street conspirators to thoughts of revolution in 1819. Two prefaces, both dated Dorchester Jail, November 1820---rather good propaganda this—were bound in with the sheets of my 1819 edition, and the book continued to be sold, at first by Carlile’s 'shrewish' wife Jane, then when she joined her husband in jail, by the dedicated ‘shopmen and women’ who to evade capture themselves operated at one time an ingenious self-service system ( ‘The Invisible Shopman’ ) which consisted of a clockwork apparatus that allowed customers to select the publication they required, which was duly dispensed to them via a series of chutes, flaps and pulleys, a bit like those vacuum tubes you used to find in old-fashioned department stores in the fifties. Thanks Robin. Wise words as always. 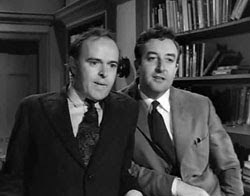 I remember Kenneth Griffith (obit 2006) from "Only Two Can Play' (one of a small group of movies featuring librarians--that's him right with Peter Sellers) and of course as the mad old curmudgeon in 'Four Weddings...' Wikipedia reveals he kept death threats from the Ulster Volunteers proudly displayed on his wall. I guess you saw them. The full title of his TV documentary was 'Thomas Paine, The Most Valuable Englishman Ever' --ambiguous and provocative at the same time. The Wiki entry also reveals that his parents during WW2 '...at his request gave him a leather-bound copy of Hitler's Mein Kampf: he later explained in interview that he wanted to understand what he was fighting against.' A good point--not everyone who buys Mein Kampf is a foaming fascist, just most of them. I have seen a few Carlile books in my time, some at the house of the late, great Paul Foot, but need a few more (and some 'Queen Mabs') for my customers. What happened to KG's books? That would have been a useful house call! Actually, Paine was not an atheist. He was a deist, someone who believes in God as a creator but not not in God as interventionist or anything in organized religions. Paine is much more controversial in the US where his deism has traditionally been seen as un-American - 'filthy little atheist' - T Rossevelt. As far as I can remember his deism was actually not much different from Jefferson's but TJ's true beliefs and practices are (also traditionally) largely unexamined in the US.